I saw this heart pillow on Pinterest and I immediately knew I needed to make one. 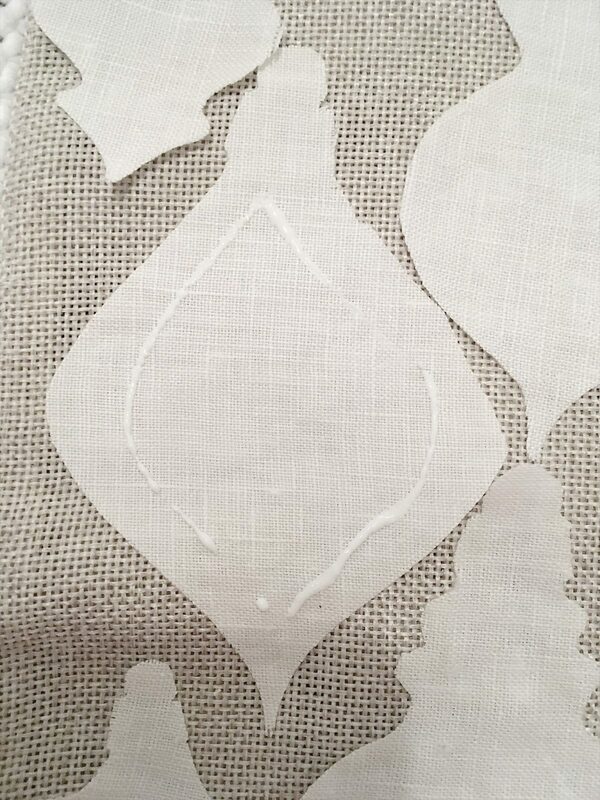 But I wanted to make a Christmas ornament pillow, not hearts! I don’t know about you, but I’m a big fan of decorations that are festive, but not overwhelming. 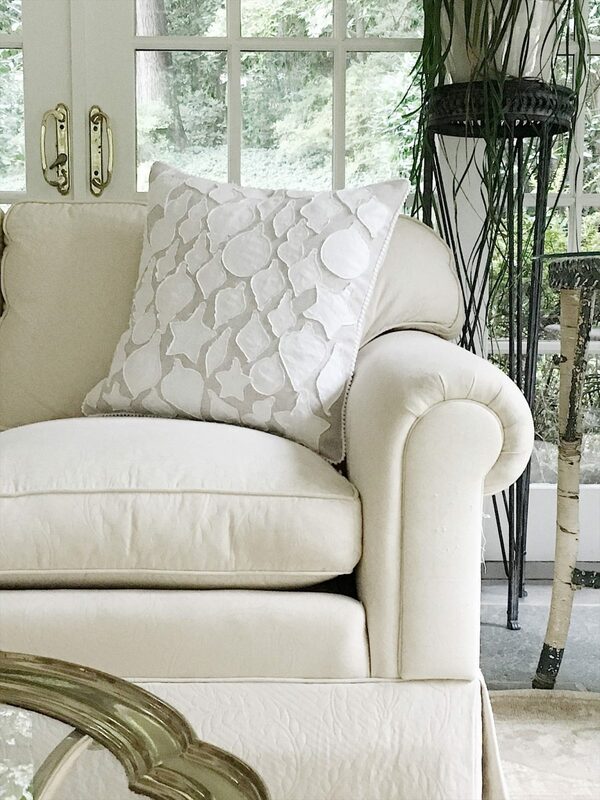 This pillow was a bit vintage and also a bit farmhouse. 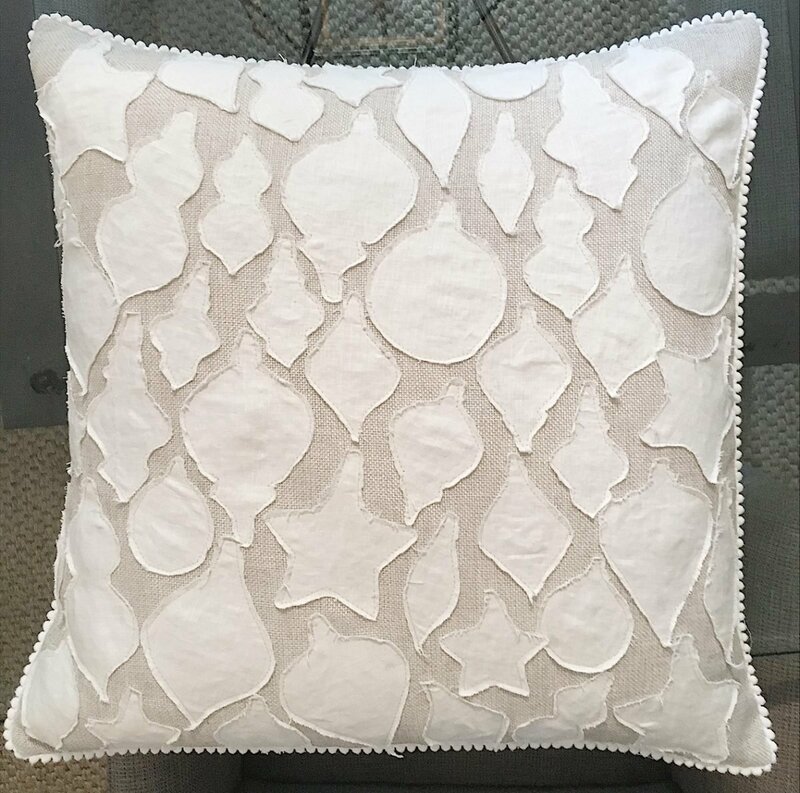 And what’s better than a holiday-inspired pillow with antique Christmas ornaments! As I stated above, I found a great DIY posted by Endlessly Inspired but after reading it, I knew I had to simplify it. So how did I make it easier? I used pillows that I bought at a store instead of making them myself! 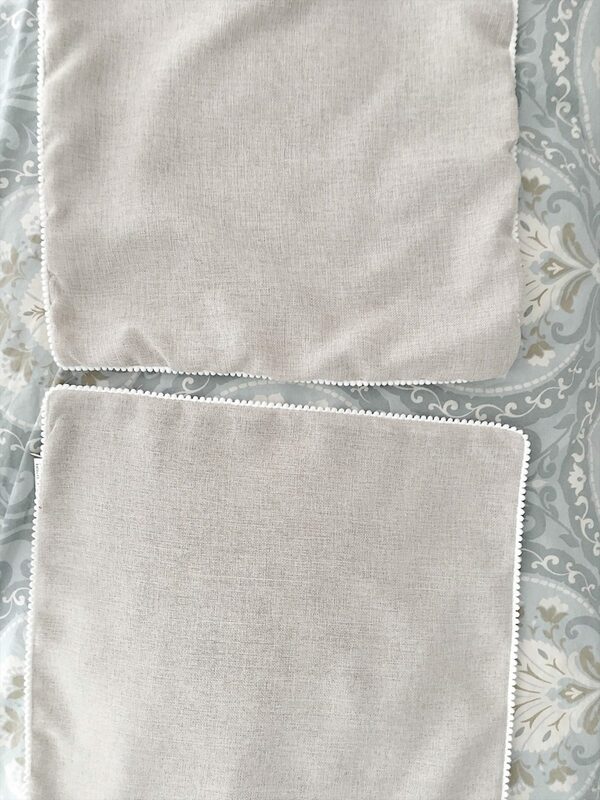 The pillows came in a set of two and cost less than $10.00 each. You can use any ready-made pillow. Just make sure that it has a zipper before you buy it… this is key! The opening also needs to be pretty large. Like almost all the way across the entire end. (You will need access for sewing.) 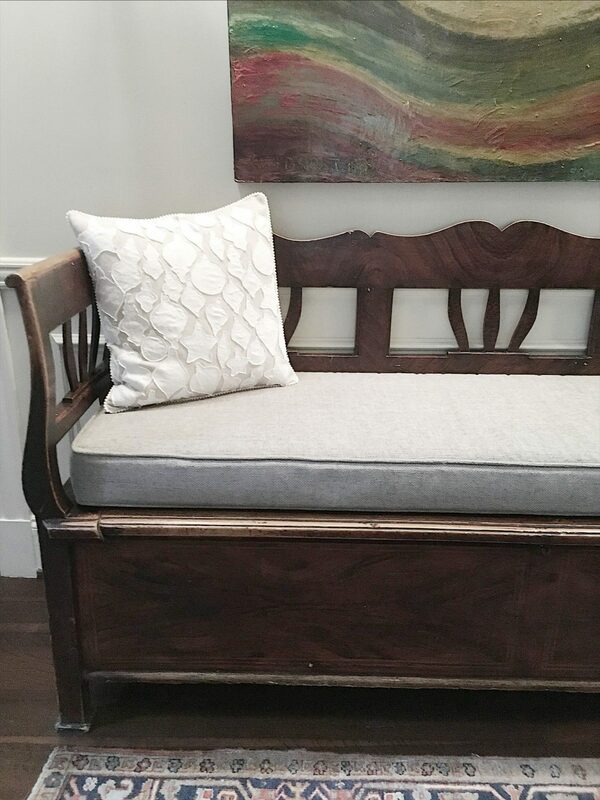 The pillow I purchased was a linen/burlap type fabric with a cute edging. Okay… let’s get onto it! 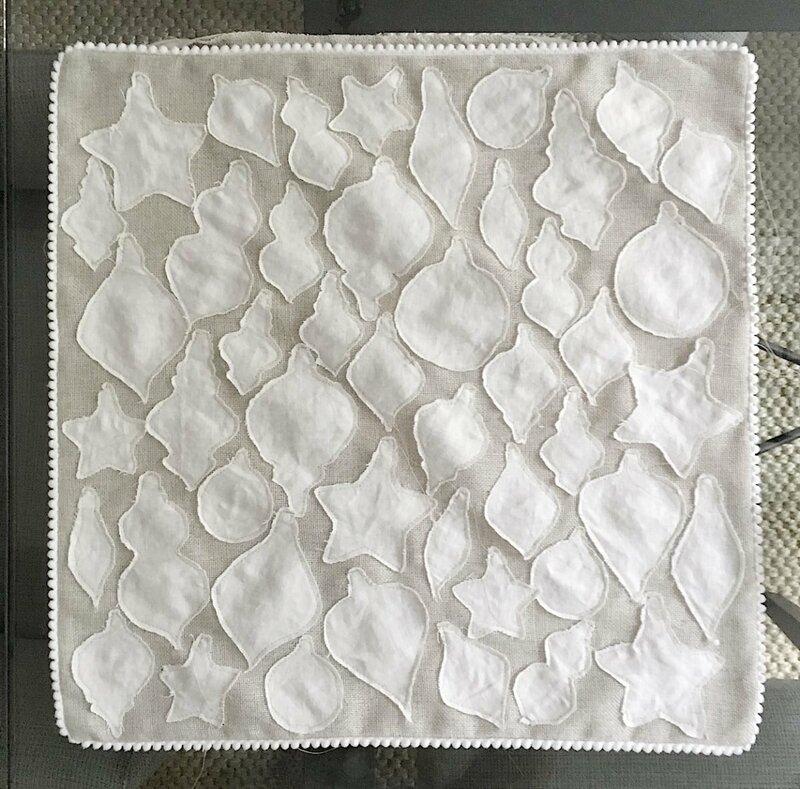 Remove the pillow filling and prewash and dry both the pillow and linen fabric. Iron to ensure they are flat. 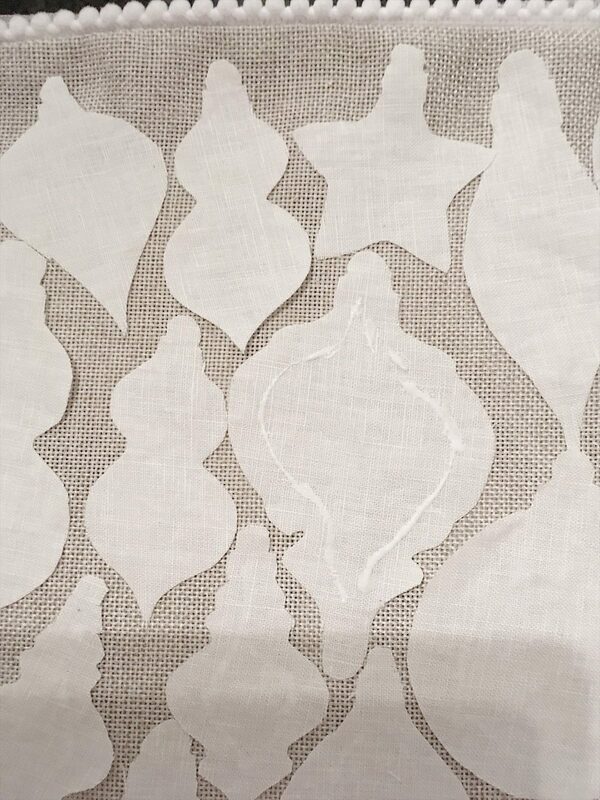 Using the patterns provided, cut out as many ornaments as needed to cover your pillow. 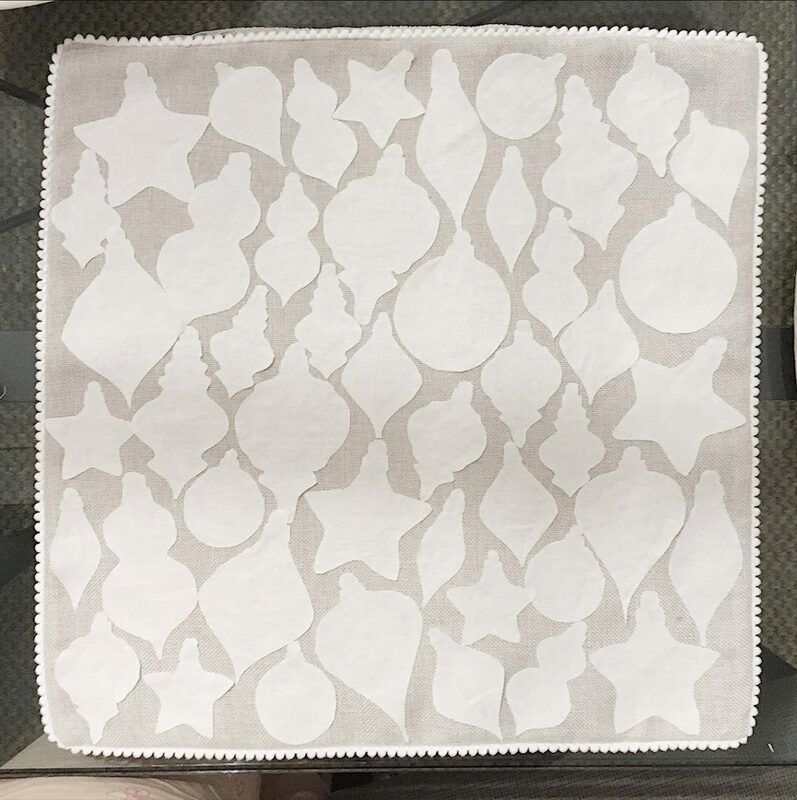 I used an 18″ x 18″ square pillow and cut 50 ornaments. Fold over the fabric and cut two at a time. I used 16 large ornaments and the rest were medium sized. But it’s up to you. 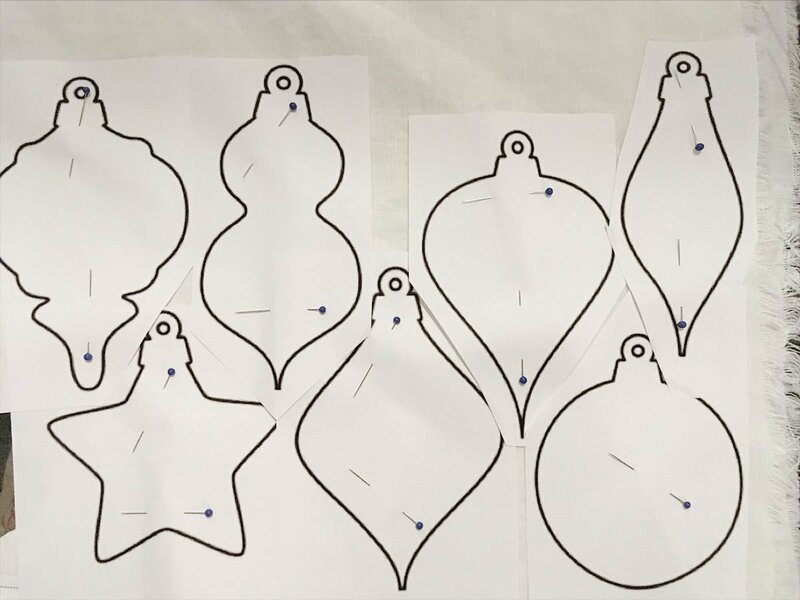 Lay the ornaments out on the pillow as you cut each one out. Be sure to place them very close together. I even had a few overlapping. 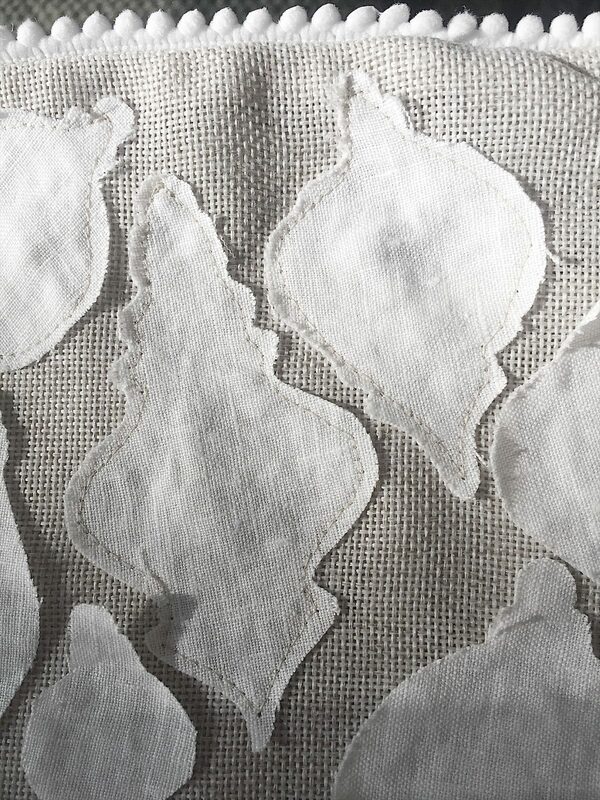 Next, place the fabric glue about 1/2″ from the edge. Don’t put the glue near the edge because you want the edges to eventually unravel. Also, you don’t need a lot of glue. Flip over each one and press gently on the pillow to adhere the glue. Let the glue dry for at least an hour. 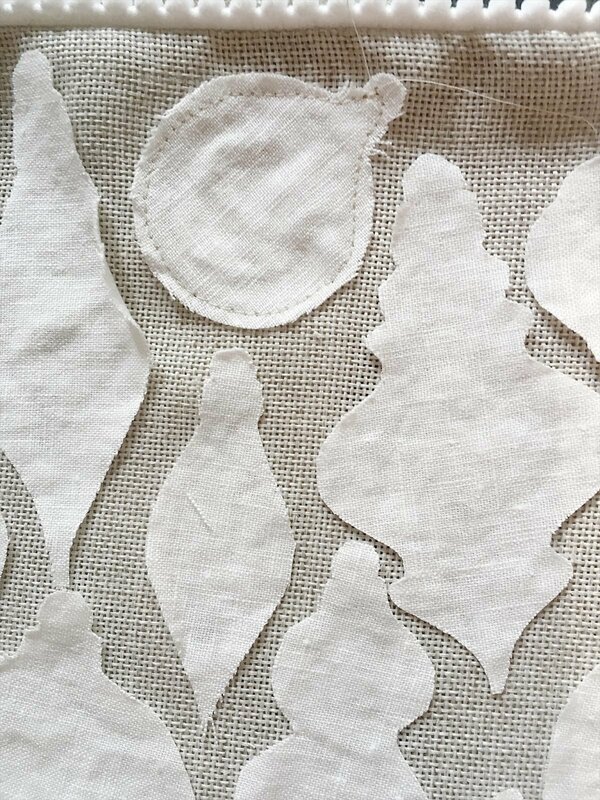 Sew around the edges of all of the ornaments. I used a sewing machine but you can also hand stitch. (I knew the machine would be faster.) Be sure to backstitch so the thread doesn’t come loose. Also, be careful not to catch the backside of the pillow when you are sewing. When completed be sure to trim all of the threads. At this point, you may want to put the Christmas ornament pillow back in the washer and dryer to get a more weathered look. I didn’t have enough time but I may still do it. I can’t decide because I like my pillow so much already! And that’s it! I really love the way this turned out. What do you like when it comes to decorating for Christmas? Are you bold and bright or more subdued and basic? Do you go all out or add a few touches here and there? I love this! So simple yet elegant too! Great idea!!! Thanks Melissa! It was fun to make and I love the pillow I found at Homegoods. Where are the downloads for this project? Under the supply list. Just click on them! This looks like a fun project! Thank you so much! It sure is! And super simple! 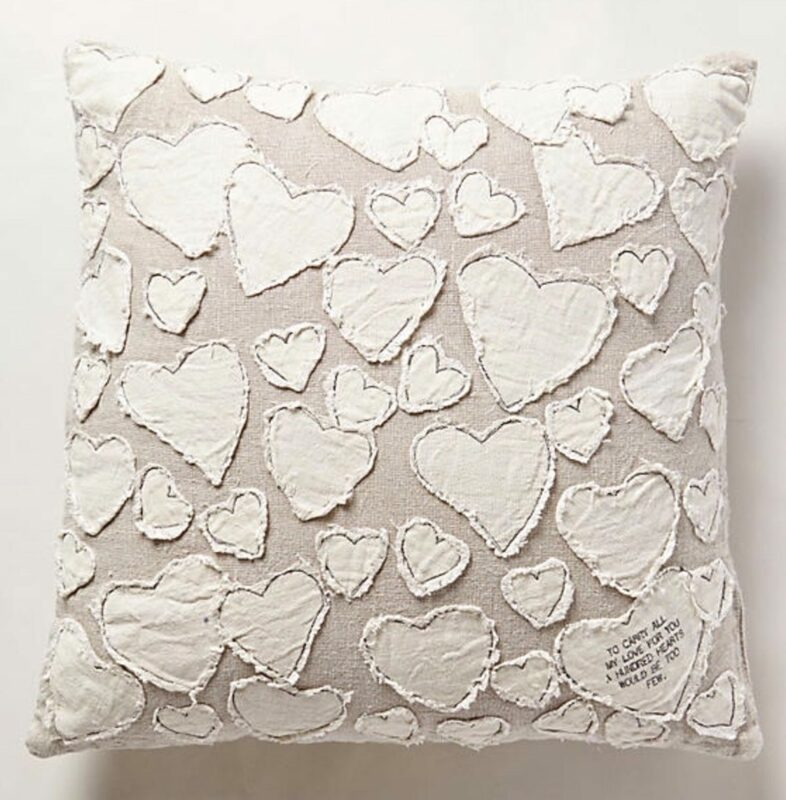 I love this pillow,❤ I made the heart pillow a few years ago, might have to do this one too! Gorgeous! I have to find a way to make one (or 10) of these ASAP!